The Plymouth History Centre project – in which the University of Plymouth is a key partner – has been given a massive vote of confidence after being recognised as a National Portfolio Organisation (NPO) by Arts Council England (ACE). The History Centre, currently under construction near the main campus, will receive a total of £4,146,000 over the four-year period from 2018-2022. It will enable it to stage national and international exhibitions, run a dynamic events and community engagement programme and commission new work by emerging and established artists responding to its collections and archives. 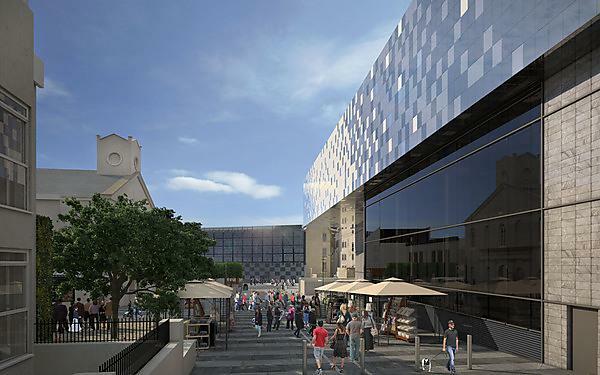 Due to open in Spring 2020, the History Centre is a partnership led by Plymouth City Council with the University, the South West Film and Television Archive, the South West Image Bank and the National Museum of the Royal Navy. Major funding for the project has been confirmed from the Heritage Lottery Fund, Arts Council England, Plymouth City Council, the Coastal Communities Fund, the Garfield Weston Foundation, the University and the Wolfson Foundation. The University has played a lead role in transforming Plymouth’s visual arts sector, which has been on an astonishing trajectory since it hosted the ‘British Art Show 7: In the Days of the Comet’ in 2011. That prestigious exhibition, which only tours the UK once every five years, established new partnerships among many of the city’s cultural organisations. Since then a range of other high profile shows and artists have been brought to the city and ‘Ambition for Excellence’ funding has been secured from ACE to help develop the sector further. That has included establishing the Plymouth Art Weekender, a three-day celebration of the city’s visual arts which takes place in late September and has quickly become the largest event of its kind in the country. The wide-ranging public arts programme at the University of Plymouth plays a pivotal role in building culture and art in the city and the South West.